Alfie Kohn is an absolutely BRILLIANT thinker who will get you to think critically and question a lot of common assumptions. Alfie Kohn (b. October 15, 1957) is an American author and lecturer who has explored a number of topics in education, parenting, and human behavior. He is considered a leading figure in progressive education and has also offered critiques of many traditional aspects of parenting, managing, and American society more generally, drawing in each case from social science research. Kohn's challenges to widely accepted theories and practices have made him a controversial figure, particularly with behaviorists, conservatives, and those who defend the specific practices he calls into question, such as the use of competition, incentive programs, conventional discipline, standardized testing, grades, homework, and traditional schooling. 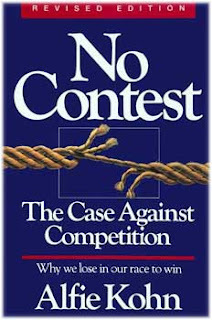 "Most people lose in most competitive encounters, and it's obvious why that causes self-doubt. But even winning doesn't build character; it just lets a child gloat temporarily. Studies have shown that feelings of self-worth become dependent on external sources of evaluation as a result of competition: Your value is defined by what you've done. Worse -- you're a good person in proportion to the number of people you've beaten. In a competitive culture, a child is told that it isn't enough to be good -- he must triumph over others. Success comes to be defined as victory, even though these are really two very different things. Even when the child manages to win, the whole affair, psychologically speaking, becomes a vicious circle: The more he competes, the more he needs to compete to feel good about himself... Consider one of the first games our children learn to play: musical chairs. Take away one chair and one child in each round until one smug winner is seated and everyone else has been excluded from play. You know that sour birthday party scene; the needle is lifted from the record and someone else is transformed into a loser, forced to sit out the rest of the game with the other unhappy kids on the side. That's how children learn to have fun in America. Terry Orlick, a Canadian expert on games, suggests changing the goal of musical chairs so children are asked to fit on a diminishing number of seats. At the end, seven or eight giggling, happy kids are trying to squish on a single chair. Everyone has fun and there are no winners or losers. What's true of musical chairs is true of all recreation; with a little ingenuity, we can devise games in which the obstacle is something intrinsic to the task itself rather than another person or team."